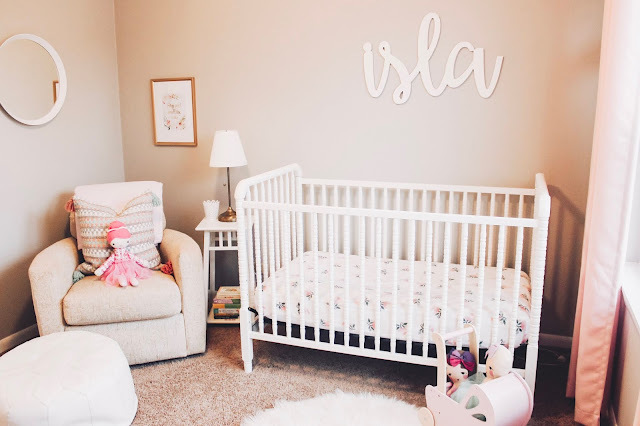 Welcome to Isla's nursery, it's one of my favorite rooms in the house! 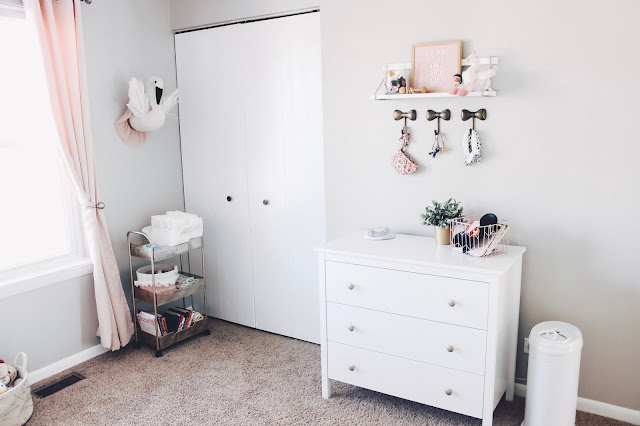 After finding out we were expecting our third daughter, I knew I wanted to keep her room simple and sweet. 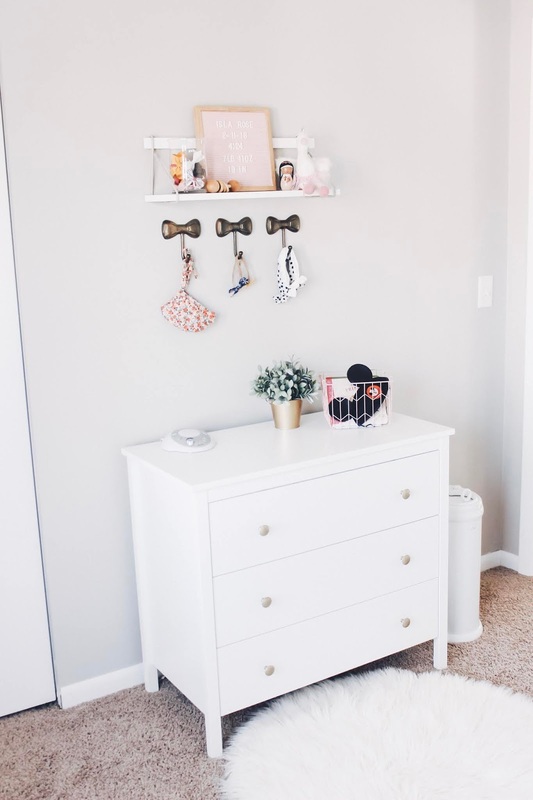 Her middle name is Rose, after my late Grandmother and I knew I wanted to incorporate little hints of roses throughout the nursery. Once I found her crib sheet, it gave me a direction of a color scheme and everything else fell into place from there. We used the same chair and crib in her big sister's nurseries, but had to buy a new dresser, we went with our FAVORITE line of dressers from IKEA and I'm so happy with it! The drawers are really deep and allow for great storage, we have three other dressers from this line in our house, they are the price performer! Once I had the decor finished, it was time to get ALL of my storage bins out from when the older girls were babies. 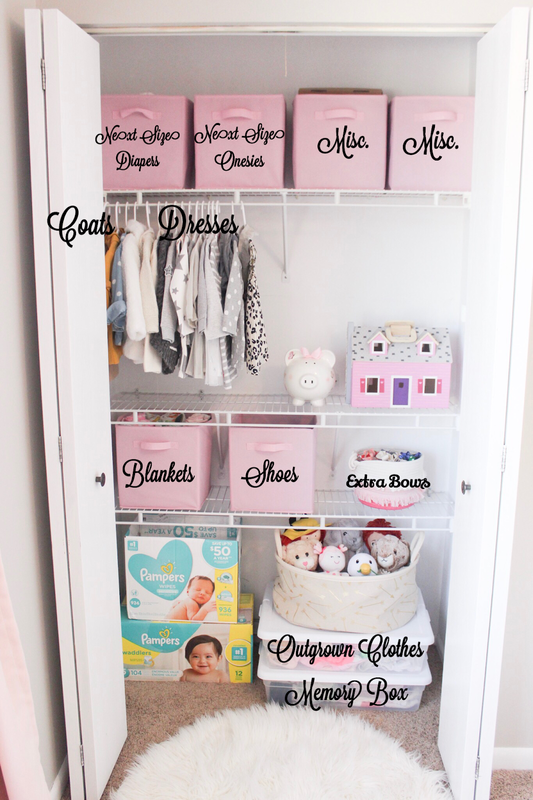 Organizing ALL the babies things can be a bit overwhelming, especially your first time around! Since Isla is our third little lady, I learned a thing or two from my older girl's nurseries and was able to really simplify this time around. 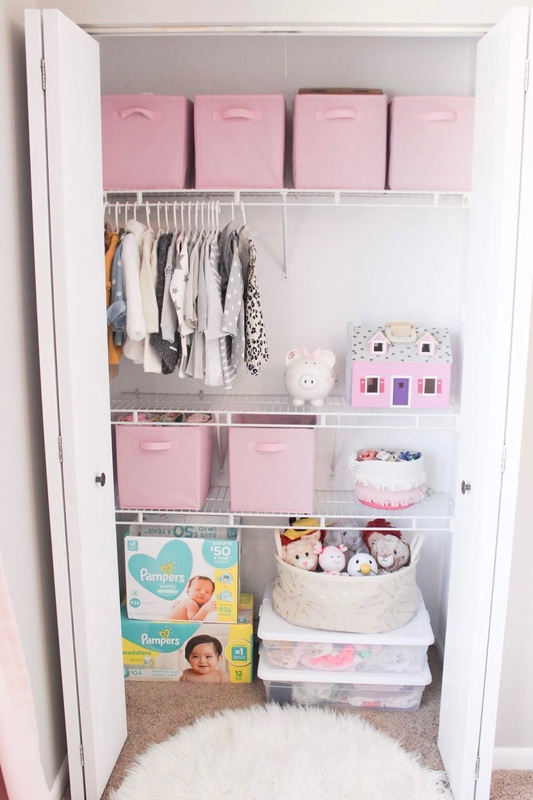 Read on to get my tips on how to organize your nursery. 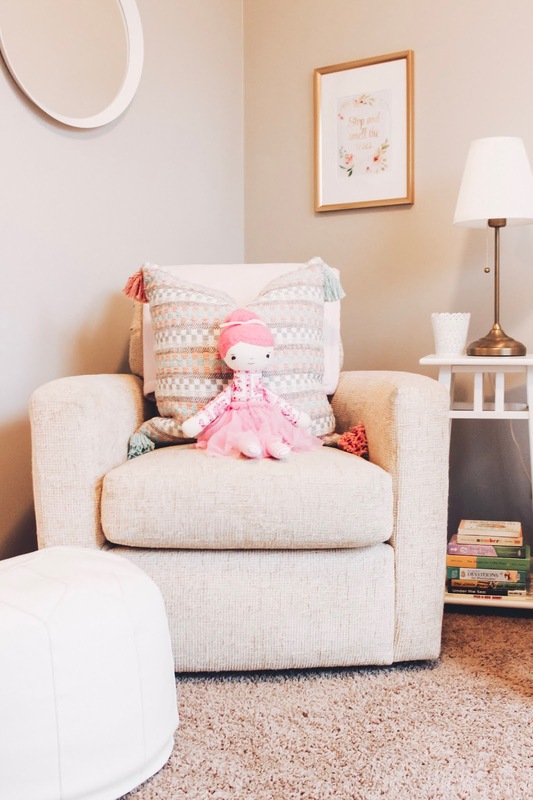 * Small Nursery Tip: We bought our chair when we lived in the city and Avery had a nursery even smaller then this one. A swivel chair is a great option if you don't have enough space for a glider/rocking chair, just make sure you get a comfy ottoman too! Let's start with the biggest "job" of the room, organizing the closet! I highly suggest grabbing some of these storage bins from Amazon, they come in a multi-pack, are inexpensive, sturdy and can hold a ton of stuff! I had planned on buying cute labels to hang off the handles too, but clearly didn't get around to it. The bins on the top shelf are things that I don't need access to on a daily basis. * Mom tip: I buy a small pack of the next size diapers to have on hand, that way when I think Isla is outgrowing her current size, I can try on the next without ordering a huge box! We love Pamper's swaddlers and have used their diapers and wipes for all three girls. I also have a bin of the next size onesies and footed pajamas, these are great to have on hand when I think Isla will be ready to move on to the next size as well. Finally, I have two empty bins for all the misc. "stuff" you will have, items like nursing covers, extra changing pad covers, extra crib sheets, etc. It's nice to have a few empty bins, trust me, they will eventually fill-up! When it comes to hanging clothes, I only hang up coats and dresses, I find it easier to have all other clothes folded and put away in the dresser. Blankets, shoes and extra hair bows are also kept in storage bins, ready to go when needed. * Mom tip, you DON'T need shoes for baby, seriously, my oldest daughter Avery had more shoes then I did when she was a baby and I think I put shoes on her once or twice!? Have one or two pairs of "soft" sole shoes, like a pair of moccasins or booties and that will be plenty! We always have a big box of wipes and her current size of diapers in the closet, we keep diapers in both the diaper cart in her room and in a basket downstairs. A cute basket filled-up with the softest stuffed animals ever sits on top of two storage bins. In the top bin I keep clothes that she has outgrown, once this bin gets full, I transfer all those clothes into a larger storage bin, label it with the size/season (ex: Size 6-12 Months Winter) and take it down to our crawl space. The second bin serves as a "Memory Box," I keep all the little memories we gather throughout the year in there, for example, cards from when she was born, hospital bracelet, her coming home outfit, monthly "stat" sheets from the doctor and anything else I want to save for her. 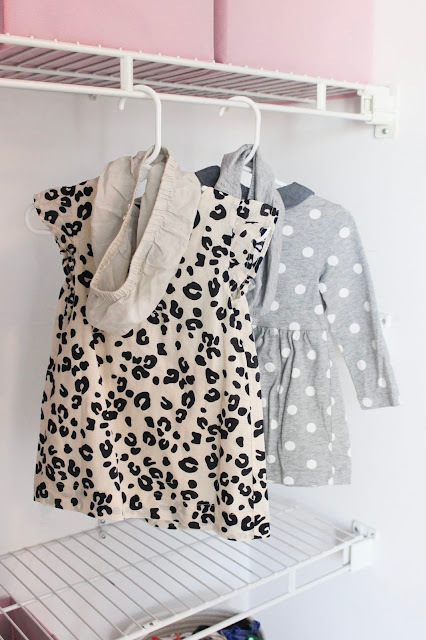 * Girl Mom Tip: hang the diaper covers for each dress on the hanger with the dress! 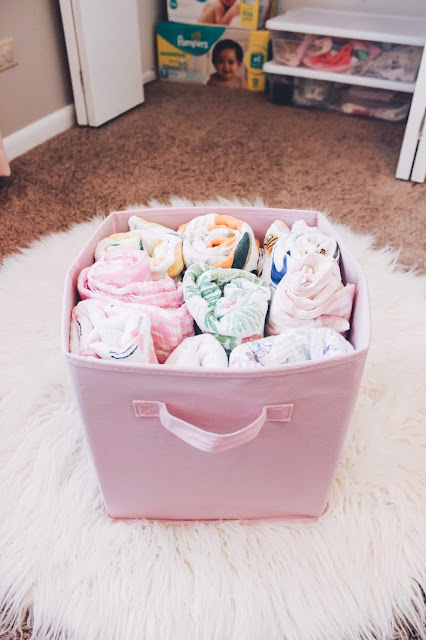 Over the years, I have tried storing those little diaper covers so many different ways and have found this to be by far the best way. * Storage tip: Roll-up your swaddle blankets! 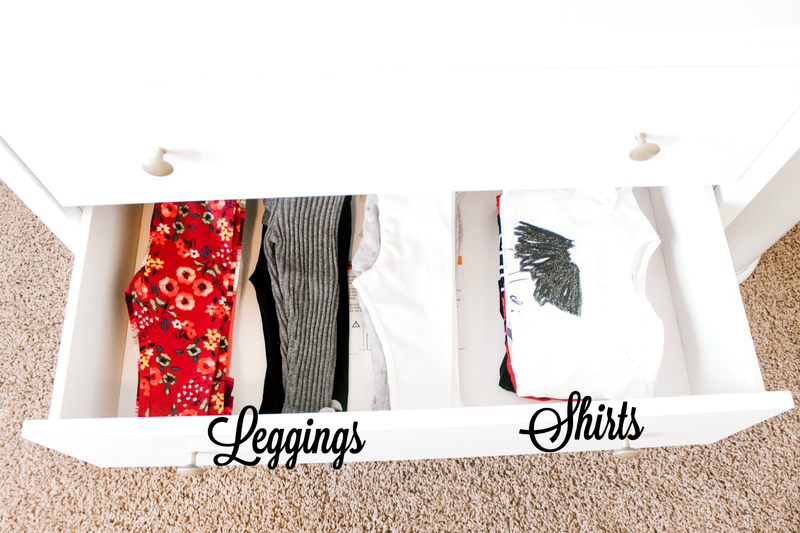 It's easier to find exactly what blanket you want and it takes up a lot less space then folding them and keeping them in a drawer! 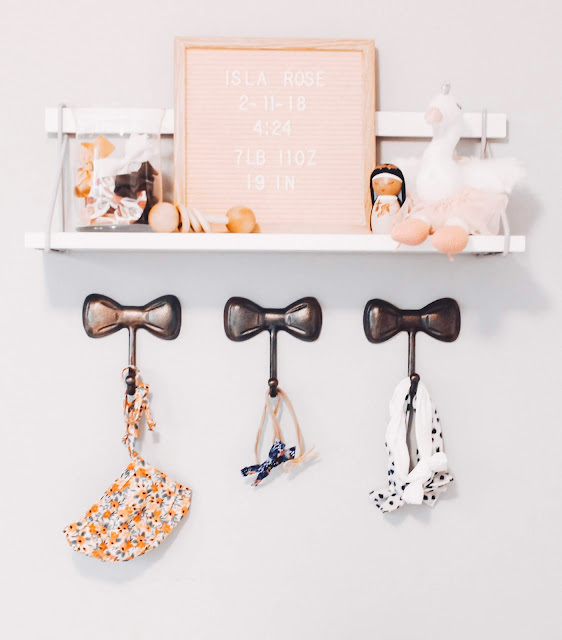 The Darling Bow Co. / Bow Bundles / Little Poppy Co.
* Girl Mom tip: I like to keep "off season" bows in a basket, seasonal colors, holiday bows, etc. that I don't need access to on a daily basis are kept in the closet. Socks are an item that I need quick access too, so I keep those in a basket on her diaper cart. 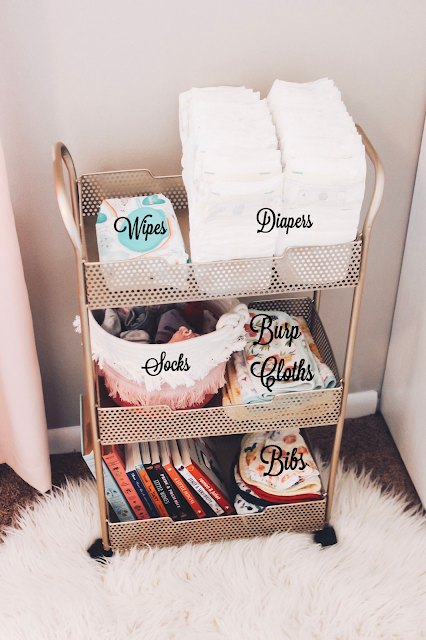 Isla only has one smaller dresser in her room, so I decided to use a cute cart to store her diapers and a few other nursery essentials! On the top shelf we usually keep diapers, wipes and diaper cream. 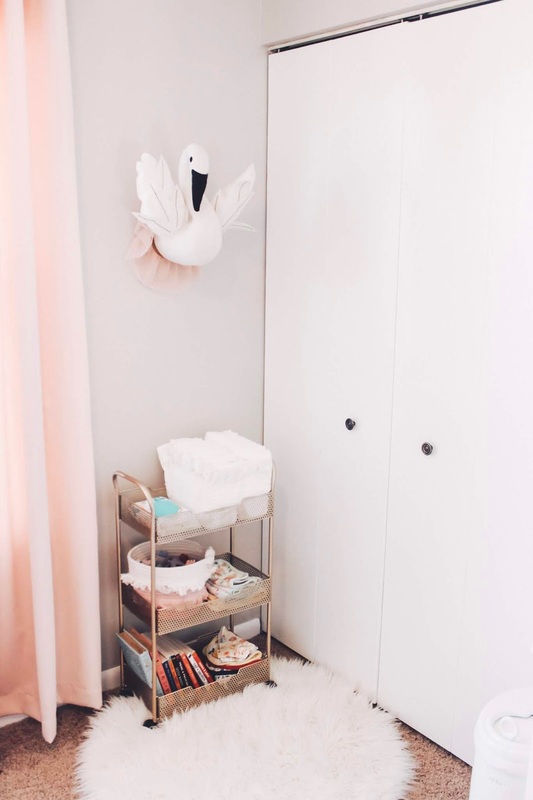 I love that this cart is on wheels because you can easily move it from room to room, or closer to the dresser where the changing pad used to be. The second shelf is the basket with socks, as well as my favorite burp cloths. Finally, the bottom shelf stores books and bandana bibs, perfect for when baby starts to cut teeth and has extra drool! * Girl Mom Tip: I keep on season bow clips in the glass jar and hang my favorite headbands on the hooks. Looking inside her drawers, I keep bodysuits, onesies and pajamas in the top drawer. I prefer using the "tank" style onesies to layer under long sleeve tops and sweaters/sweatshirts in the winter. 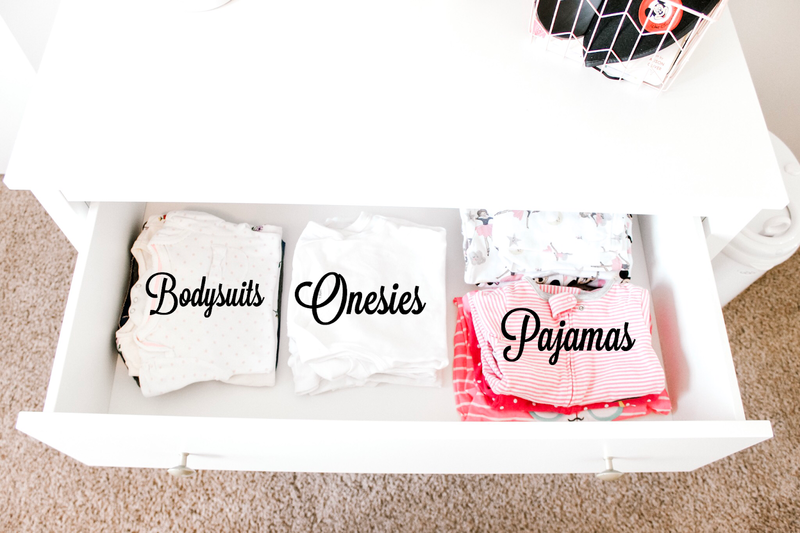 Zipper pajamas are also a favorite at our house, I love the solid color sleepers from Old Navy and Carter's has great budget friendly one piece pajamas too. In the next drawer, I fold her leggings and long sleeve shirts. I try my best to keep her leggings in groups according to color, but not going to lie, when laundry gets out of control, all the colors live together! The bottom drawer holds a lot of her seasonal clothes, right now in the winter months I store her sweaters and sweatshirts, in the summer months I keep one piece "bubble" outfits and swimsuits. 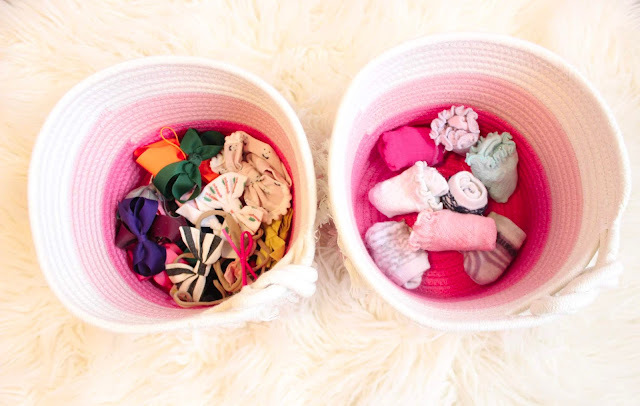 *Storage Tip: Keep the items you use the most onesies, pajamas, burp cloths, socks and bows easy to reach! 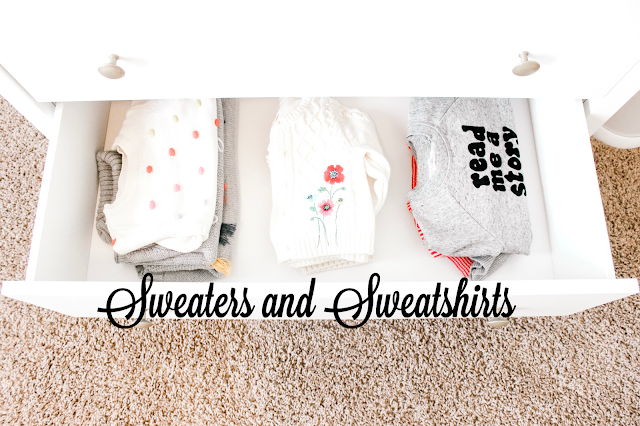 As a Mom, we are usually doing things one handed (baby on the other hip), so make life easy and really think about where you want to store your most used items! Phew, organizing your sweet little baby's room can feel overwhelming, but just remember LESS is MORE! You really don't need a ton of extra items, trust me, you will be doing a lot of laundry ;) Take your time and organize little by little, I use to love going in my girl's nurseries before they were born, just dreaming about the little baby that would be sleeping in there one day. Congratulations on your new arrival, I hope some of these tips will help you prepare for your greatest adventure yet! This is my favorite post yet! Organization is so fun, yet can be so overwhelming. Great tips- even for a boy mom! I’m ready for Ben to wake up from nap (but am I?) so I can tackle his dresser (we love the same IKEA style) yet again!! You are SO organized too- I'm sure you have plenty of tips you can share with ME! Give Ben a smooch from Aunt Britt, miss you all already! I'm definitely coming back to read all of this when that time comes in the future! Everything is so cute and organized! 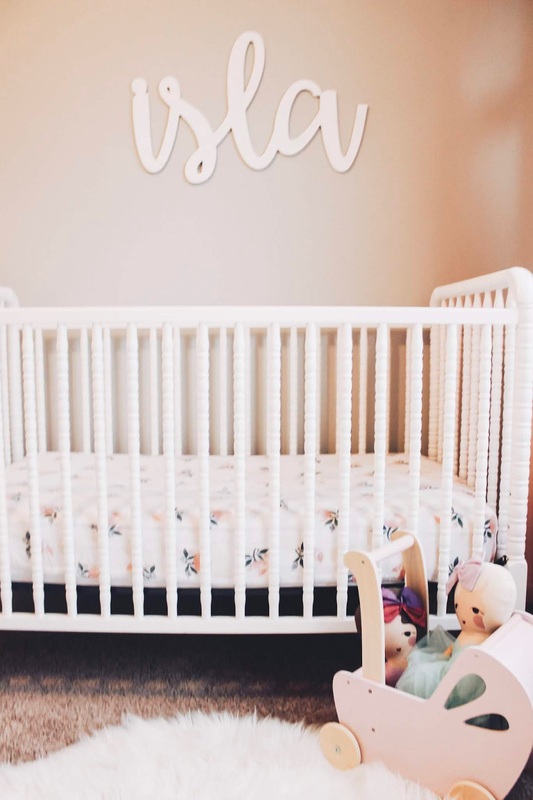 Thanks so much for reading, I have LOVED setting up each of my little lady's nurseries and know that you will love it one day too, have a great week ahead! Great tips! And such a darling nursery! I'm getting ready to transition our little guy to a big boy bed and I don't think I'm ready yet...I adore his sweet little nursery just the way it is. Thank you! We still need to transition my THREE year old out of her crib and if you knew her, you would understand why, ha! I'm thinking we will finally make the move this month and I'm dreading it!